Thirty years ago – holy crap, 30 years ago! – I was attending the University of Washington in Seattle and spending most of my time at the college radio station, KCMU. I had discovered the station the summer before I started at the U-Dub; it was an 18-watt FM radio station that had recently switched to being an entirely student-run concern, and they played songs by English bands like XTC and the Psychedelic Furs. KCMU (“Riding the New Wave”) also played a lot of local bands, from those that actually put out records (Blackouts, Fastbacks) to bands that recorded their songs in the station’s production room and transferred their tunes to “carts” so the DJs could play them (The Beefeaters’ “Caffeine”) – if you’re wondering where KEXP’s Audioasis show got its start, wonder no further. 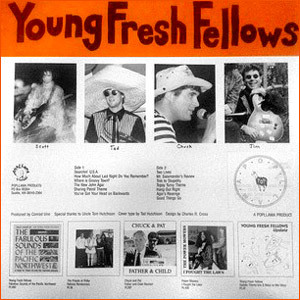 The Young Fresh Fellows were a Seattle band made up of transplants from the Midwest. Their first album was a spunky thing called The Fabulous Sounds of the Pacific Northwest, and by 1985 they’d accumulated quite a following, so much so that when their sophomore LP, Topsy Turvy, came out, they actually got written about in Rolling Stone. Topsy Turvy was a plucky effort that upped the ante on the band’s power poppy songs and the pr oduction by Seattle stalwart Conrad Uno showcased the songs in a way that was miles beyond Fabulous Sounds. The Fellows toured a lot – hell, they just played a lot – and they built themselves a following that got them signed to Frontier Records out of Los Angeles. Soon there were lineup changes, Frontier inked a distribution deal with a maj0r label, the Fellows really took off, and then… I don’t know, did they implode? 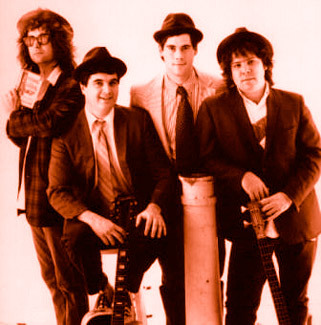 Did Scott McCaughey (“mc coy”), Jim Sangster, Tad Hutchison and Kurt Bloch (who was also in the Fastbacks and replaced Chuck Carroll in the YFFs) run out of steam? Did grunge kill Seattle’s power pop scene? What happened to The Cowboys? The Heats? The Moberlys? Well, I’ll leave you to Clark Humphrey’s book Loser or Pete Blecha’s Sonic Boom to figure that out. All I know is, the Young Fresh Fellows were one of the most fun outings you could have in the early ’80s in Seattle. I put on Topsy Turvy today and realized that three decades had passed since that exciting white vinyl album was released. I loved then, as I do now, how the Fellows showed the world what a great town Seattle was with their songs and crazy antics. How much about going to a Fellows gig do I remember? Let’s see: Scott’s Les Paul goldtop with the words “bag o’ poop” on the front. Tad’s cymbal stand that was actually a super tall bike pole with a wok on top – he’d time his hits on the wok to when the thing swung first away from and then back at him, ducking just in time to miss getting clocked on his cabeza. Or Jim’s short scale Danelectro bass and the way he just hopped up and down, clearly having a fantastic time playing it. Or Chuck’s crazy ties and his amazing solos. Or the time they played at the Rainbow and I was so drunk I took 5 or 6 pint glasses that I had emptied into myself and tucked them into the sleeve of my jacket so I could have some free beer glasses in my college pad. Or me joining them onstage at the Hollywood Underground after I refused to stop shouting for “Give It to The Soft Boys” until they finally surrendered as long as I would sing it. Of course I would! 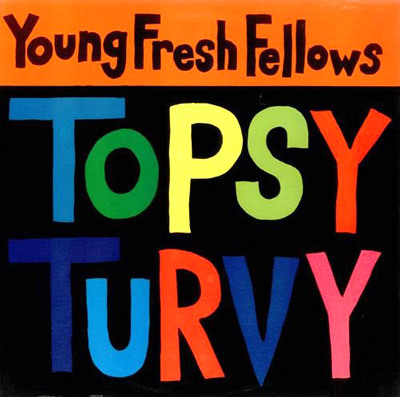 Did I mention that, besides having great songs like “Where Is Groovy Town?”, “Hang Out Right” and “The New John Agar,” Topsy Turvy had their cover of the Sonics’ “You’ve Got Your Head On Backwards”? The mix of power pop, hoaky country western, cute folkie ditties and kooky klassics like “Trek to Stupidity” was what made Topsy Turvy so terrific. And it’s what makes it continue to thrill thirty freakin’ years later.